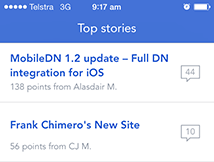 I'm very happy to announce the new version of MobileDN, my iOS Designer News app is now available for free in the App Store. This is a big update, bringing a lot of the new API integration right into the app. I'm super excited to share all this new functionality with you. As always, I'd love to hear your feedback. I have some comments, if you don’t mind. Even if you choose to not act on the suggestions, I hope they help make the app even better. It's possible to sign in with empty credentials. It might be good to disable the Sign In button until there’s something in both fields. It doesn't seem like there's a down state on the table view cells. It’d be nice to be able to know when and where I’ve tapped. “No one has said anything yet” displays while fetching comments, even if people have commented. It seems like a better empty state might be to leave it completely blank? Search could be added to the top of the Top and Recent tabs, saving a tab, but also reducing number of taps from 2 to 1 in most cases (tap search field and typing vs tap search tab, search field and typing). Probably not entirely correct as search covers the entire site, not just top and recent, but it still feels like it could be an improvement? If you did keep search as a tab, maybe highlight the search field when the tab is selected? Seems like you don’t need a separate sharing settings screen? Everything fits pretty well on the one tab. Great update! One minor critique: on the login screen when the email field is highlighted, I would switch the iOS keyboard over to the one with the @ key at the bottom. Can you do me a favor and also follow up with about a million app developers? 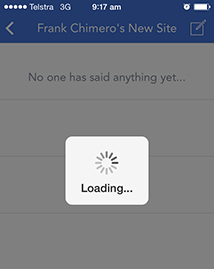 It's really easy to do for a mobile site (). So I'm guessing there must be some barrier that's preventing most iOS app developers from doing this?! No, it's very easy. They just don't think/know. You are the bomb, man. 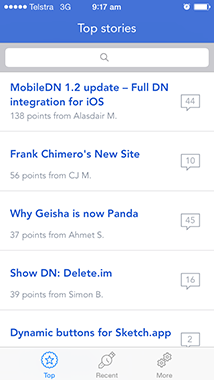 This has just officially replaced the DN web app link on my home screen. I remember buying a DN app, which couldn't even launch on my phone because it crashed. You've not only made a good app, you're updating it too. Mad props to you. I would gladly pay for this app and I'm guessing many others too. Can I donate money to you for the app? Feels like cheating to get such a sweet app for free! Awesome job you have my upvote, but what about the non-members? They can not use the app to just read the feed as they use to do in the previous version. I get that DN wants to keep it close but isnt this a bit too elitist? This was something I thought about too. It would be great to preserve the "spectator" views if possible. That said, it may be a huge challenge programmatically so pragmatically speaking, for a proof-of-concept, 1.2 is exceptional. Nice job! This post send from MobileDN app and I love the new update. I agree with Parker as well - I'd like to donate at least a few bucks for this. -On the login page, you should set the email input field to use the email keyboard for easy access to @ & .com -Comment scrolling seems to be slightly laggy/jittery now. HI Harouth! Ahmet have already done a DN Android app, which you can find here. He released the source code, so I'm trying to schedule future features and improvements with him. LOVE THE APP! 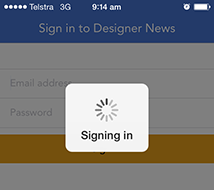 One small fix: on the sign in form, it would be nice to have a 'Next' button on the keyboard to jump from the email field to password field. Using the 'Return' key is another option. But, The screens looks great!! Keep up the good work. Good idea, I'm giving it a try. Nice! MobileDN became the most used app on my iPhone :) love it. This is rad. Great job dude! Amazing! Would have definitely paid for this. GG, 134 points already. Well deserved. Great job. Love the icons! Oh yes, what a great way to start the day. Stunning work! Thanks for your effort. You're awesome. Have my upvote and my love. Have no fear! Ahmet have already done a DN Android app, which you can find here. The code is open-source, so I'm trying to collect new feature and improvements to submit a couple of pull requests to it. It's not available in the API currently. We're taking things one step at a time. Thanks a lot for making this-- where can we submit bug reports?